Child care at Dewdrops Early Learning is a central component to who we are. 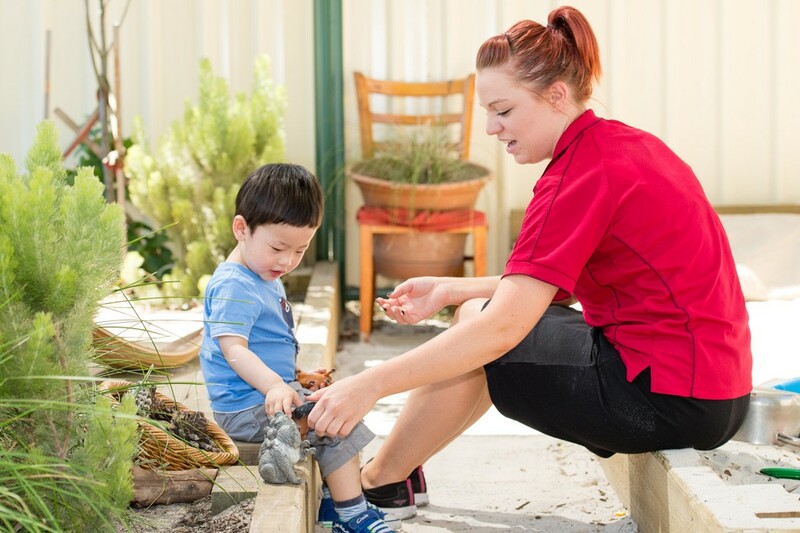 Ensuring the children at our services are comfortable, safe and nurtured is a priority. Your child will be cared for by passionate and dedicated educators, who will ensure your child’s physical and emotional needs are met throughout the day. Your child will be provided quality nutritional meals and snacks, prepared on-site by our talented cooks, to support their growth and development. Educators will also implement learning programs and experiences that will encourage your child’s fine and gross motor skills development, build on their social skills and resilience and stimulate their ever-growing minds. Book a tour today to see our child care and early learning programs in action. What does child care look like at Dewdrops Early Learning ? Your child will be supported through the transition from home to child care. We will work with you to develop routines and experiences that will allow your child to feel safe and secure in their new environment. We focus on continuity of care, which means your child will always be cared for by familiar educators, building strong and meaningful relationships. We will encourage relationship building with other children through small group activities. Your child will have lots of one-on-one care and learning experiences with educators. Your child will have access to a variety of resources, indoor/outdoor environments and sensory experiences to foster their learning and development. All learning experiences are flexible and responsive to your child’s needs and interests. And when your child is ready, we will work with you and your child to smoothly transition to the next stage in their early learning and childcare journey. We will continue to foster relationship building through small group activities and modelling respectful and positive interactions with others. Your child will develop strong connections with their educators through continuity of care and one-on-one time. Our educators will work in partnership with you to develop learning experiences that are tailored to your child’s needs, abilities and interests, and are sensitive to your child’s level of social and emotional development. Your child will have access to a diverse indoor/outdoor educational program that will take advantage of their natural curiosity and will build on their independence and self-help skills. When the time is right, our educators will assist with toilet training, making the process seamless and positive. Your child’s educators will communicate with you regularly about your child’s learning and development. We will prepare your child for their next learning phase in the kindergarten room. Your child will join either the 3 year old or 4 year old kindergarten program. We will continue to support your child to build relationships with educators and their peers. Your child will begin to participate in targeted learning programs that further builds resilience, social skills, literacy and numeracy, and refines their gross motor and fine motor skills, in preparation for school.